SINGAPORE - Singapore intends to implement a carbon tax from 2019 as part of its efforts to cut greenhouse emissions, Finance Minister Heng Swee Keat announced in his Budget 2017 speech on Monday (Feb 20). 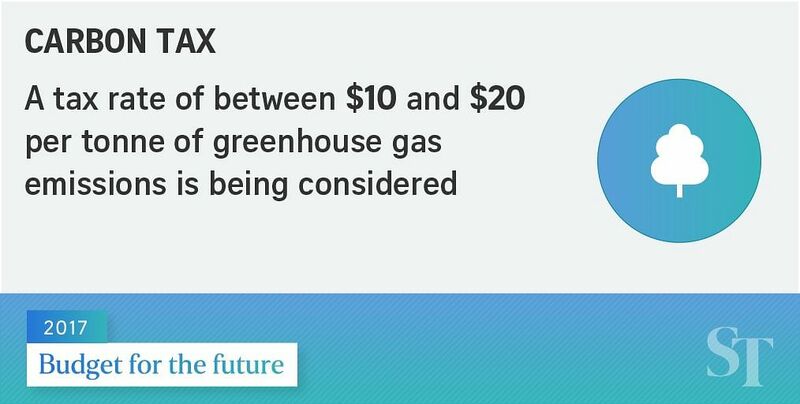 The tax is likely to be between $10 and $20 per tonne of greenhouse gas emissions, which is in the range of similar carbon tax rates around the world. Calling it "the most economically efficient and fair way" to reduce greenhouse emissions, Mr Heng said the Government has been studying the option for several years. "It will create a price signal to incentivise industries to reduce their emissions, complementing the regulatory measures which we are also introducing," he said. Revenue from the carbon tax will help fund measures by industries to reduce emissions. The tax may also spur new opportunities in green growth industries such as clean energy. The Government has started industry consultations and will begin public consultations in March. The final carbon tax and exact implementation schedule will be decided after consultations and further studies. Measures will also be introduced to help ease the transition. Mr Heng also announced that the Government will restructure diesel taxes. It will introduce a volume-based duty at $0.10 per litre on automotive diesel, industrial diesel and the diesel component in biodiesel. This is to incentivise users to reduce diesel consumption. These changes took effect on Monday (Feb 20). Currently, diesel cars and taxis are levied a lump sum Special Tax, regardless of the amount of diesel used. "At the same time, I will permanently reduce the annual Special Tax on diesel cars and taxis by $100 and $850 respectively. In this way, we shift from an annual amount of tax to one which is related to usage." For most drivers, the Special Tax reduction will offset the impact of the new diesel duty. "To help businesses adjust, I will provide 100 per cent road tax rebate for one year, and partial road tax rebate for another two years, for commercial diesel vehicles," said Mr Heng. Diesel buses that ferry school children will receive additional cash rebates. Separately, two existing vehicle incentive schemes will also be adjusted to encourage the use of cleaner vehicles. The current Carbon Emissions-based Vehicle Scheme (CEVS), which was implemented in 2013 with the aim of encouraging use of vehicles with low carbon emissions, will be replaced with a new Vehicular Emissions Scheme. Under this scheme, four more pollutants will be considered on top of carbon dioxide. The new scheme will run for two years beginning from Jan 1, 2018. This will be reviewed before it expires. The second scheme to be adjusted is the Early Turnover Scheme, which targets commercial diesel vehicles. It was introduced in 2013 to encourage the early replacement of older and more pollutive commercial diesel vehicles. The scheme, which has seen owners of 27,000 vehicles switch to cleaner models, is due to expire on July 31 this year . It will be extended for vehicle owners who turn over their existing Euro II and III commercial diesel vehicles for Euro VI vehicles until July 31 in 2019. The Certificate of Entitlement (COE) bonus period for Light Goods Vehicles will be further enhanced, with more details revealed at a later date. Singapore in 2016 joined more than 120 countries to ratify the Paris Agreement, formally committing itself to reduce climate change.